Say, stay, no need to fly on ravens’ wings. Sudden, that white-speared grin bright-rising. Green red yellow blades, Solstice’s haze-change. like a needled compass in a winter woods. Do not want to leave. My heart swells. But those black birds lift, they send every notion home. wanted to be a great, grown-up artist. But she was just a child, a foal. secure only in her heart’s darkness. of a girl intent to cradle sticks in her fist. She was only a child, an awkward foal. she would stay a child, fenced-in foal. She grasped the concept—knew it was her role. she asked for it, said she needed charcoal. artist, portrayer, purveyor of wishes? a child, fingers rushing, stumbling, legs of a foal. yellow too, a rusted hue. I tried to remember you. you, Cheshire cat of my dreams. Bertha Rogers is a poet, teaching artist, and founding director of New York’s Bright Hill Press and Literary Center. 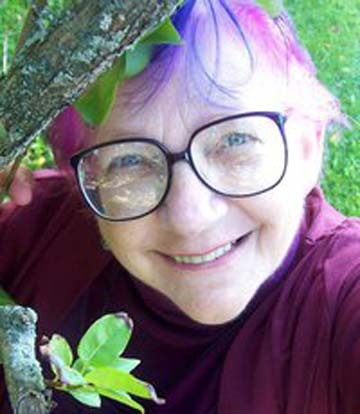 Her poems have been published in literary journals and anthologies, including Salmon Poetry’s Dogs Singing and Even the Daybreak and in collections, including Heart Turned Back (Salmon Poetry, Ireland), Sleeper, You Wake, The Fourth Beast, and A House of Corners. Her translation of the Anglo▴Saxon epic Beowulf was published in 2000; her translation of the Anglo▴Saxon Riddle▴Poems, Uncommon Creatures, Singing Things, is forthcoming. She has received grants and awards from the MacDowell Colony, the Millay Colony, Hawthornden International Retreat for Writers in Scotland, Caldera, Jentel, and others.